Saturday turned out to be great day weather wise. Everyone seemed to have lots of sunshine with the occasional patch of moody low cloud passing by from the valleys below. A good day for cloud inversions and brocken spectres, and often superb views. Inspired by Alison C, a group set off to explore the most southern tops of Creag Meagaidh (Alison C, Mike, Alan R, Anne R, Sara, Tim, Philip, Martin, Anne C). 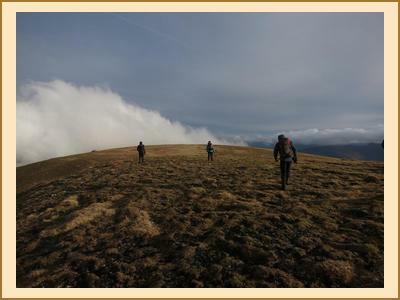 After a steep ascent from Moy, the effort was rewarded with clear tops and views right across the plateau: even the summit was visible from a distance (for the first time for many in the group!). The summit had to be visited following which Martin, Anne C, Philip and Alan R headed on to the other two Munros to the East, Stob Poite Coire Adair and Carn Liath, I explored the other Creag Meagaidh tops and the others descended via The Window. Claire and Antti had an early start for a circuit of Beinn a’ Chlachair, Geal Charn and Creag Pitridh. This proved a popular spot with another group (Alison F, Kate, Fiona C, Allan S, Adam and Ian Lay) heading into that area to do Creag Pitridh and Geal Charn. They met Claire and Antti on the top of Geal Charn. Pete also ventured to that area by bike, cycling from the East end of Loch Laggan doing a circuit round Binnein Shuas, and then up towards Loch Pattack. Bill and Eileen ticked off another Graham, Meall nan Eagan, and Pauline and Dave travelled a little further away to Glen Spean to do the Munros on the West side of Loch Treig, Stob a’ Choire Mheadhoin and Stob Coire Easain. 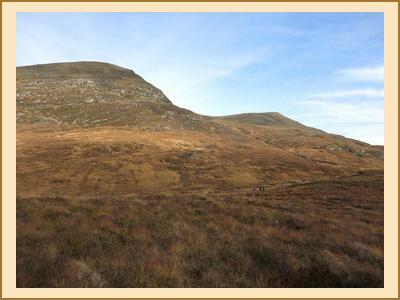 Gillian, Margaret and John, accompanied by Agnes part of the way, went north west to Garva Bridge and up Corrieyairack Hill and Gairbeinn. It wasn’t such an inviting day on Sunday but it turned out to be good enough on the hill in quite a lot of places. Alison, Cathy and Anne C stayed local and not to high visiting a nearby monument set up on a crag close to Laggan. A large group (Martin, Alan R, Mike, Allan S, Kate, Alison F, Claire and Antti) went up the Fara via Dirc Mhor. Pete and I also did the Fara but decided to approach from the East by cycling most of the way up and down. Rebecca, Philip and Ian Lay travelled west for the better weather and had a great day on Stob Coire Sgriodain and Chno Dearg, by Loch Treig. Pauline and Dave explored the Drumochter hills east of the A9 (Carn na Caim and A’Bhuiheanach Bheag) in the clag. And Bill and Eileen did another Graham on the road south, Creag Rhuadh. Only 100 Grahams left…more than half way!